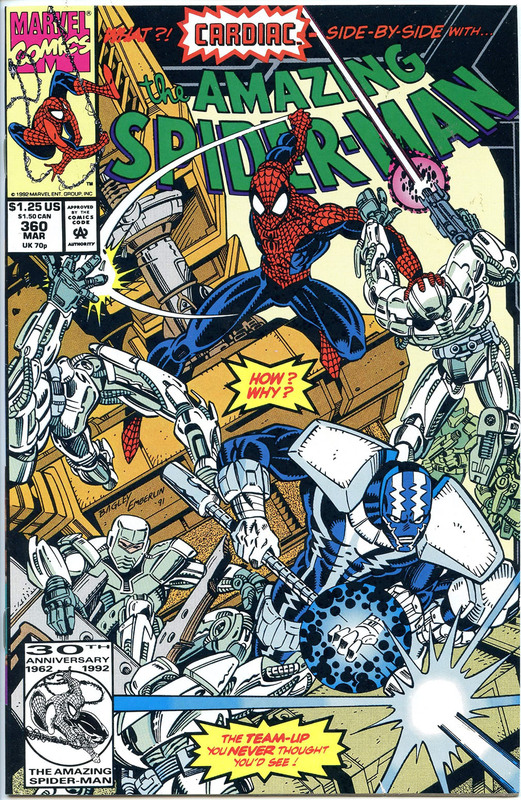 The Infinity War is a six-issue limited series published by Marvel Comics in 1992. The series was written by Jim Starlin and penciled by Ron Lim, Ian Laughlin, Al Milgrom, Jack Morelli and Christie Scheele. In this series, The Magus, the purged, evil side of Adam Warlock believed to have been dead, has returned in order to collect the Infinity Gems and recreate the Infinity Gauntlet itself. He sent evil doppelgangers of Marvel’s superheroes to attack and usurp the originals. Thanos, exiled since his defeat during the Infinity Gauntlet event, learned of the Magus’ plans and set out to aid Adam Warlock and the heroes in defending the universe. Thor debuted in the science fiction/fantasy anthology title Journey into Mystery #83 (cover-date Aug. 1962), and was created by editor-plotter Stan Lee, scripter Larry Lieber, and penciller-plotter Jack Kirby. A different version of the mythological Thor had appeared previously in Venus #12-13 (Feb.-April 1951). Journey into Mystery was retitled Thor (per the indicia, or The Mighty Thor per most covers) with issue #126 (March 1966). “Tales of Asgard” was replaced by a five-page featurette starring the Inhumans from #146–152 (Nov. 1967 – May 1968), after which featurettes were dropped and the Thor stories expanded to Marvel’s then-standard 20-page length. The reimagined title continued the numbering of The Power of Warlock and began with Warlock #9 (Oct. 1975) and ran seven issues. The bimonthly series was initially written and drawn by Starlin, but was eventually co-penciled and inked by Steve Leialoha. Doctor Strange was canceled with #183 (Nov. 1969). Four years later, Strange Tales resumed at its old numbering with #169 (Sept. 1973), which introduced the supernatural feature Brother Voodoo by writer Len Wein and artist Gene Colan. This lasted only to issue #173 (April 1974), with Brother Voodoo continuing briefly in the black-and-white Marvel horror-comics magazine Tales of the Zombie. This was followed by two different creative teams producing three stories of The Golem in four issues (#174–177), the second of these a fill-in monster-reprint issue. The next feature was writer-artist-colorist Jim Starlin‘s take on Adam Warlock, picking up the character from the 1972–73 series Warlock (a.k.a. The Power of Warlock) and reviving him in Strange Tales #178 (Feb. 1975). Another creative high-water mark, this feverishly imaginative feature from Starlin, who had similarly reinvigorated Captain Marvel, introduced the Marvel characters Gamora, Pip the Troll and The Magus, and helped establish the mythos Starlin would mine in his many “Infinity” sagas of the 1990s. After issue #181 (Aug. 1975), the story would continue in Warlock #9 (Oct. 1975), picking up from the old series’ numbering. Strange Tales soldiered on with Doctor Strange reprints through issue #188 (Nov. 1976). Although he lost part of himself when he became the Silver Surfer, Norrin Radd can never forget the woman he loved from his days on Zenn-La. With Shalla-Bal’s death never far from his thoughts, the Surfer is more haunted than ever. But when Pip the Troll delivers a message from Adam Warlock, Surfer’s hope sparks anew. Warlock claims Shalla-Bal is alive! But if so, where is she?